The party's CND group says dropping opposition to the alliance could damage the independence campaign. Anti-nuclear campaigners within the SNP have launched a grassroots campaign to stop the party leadership overturning its long-standing opposition to Nato. 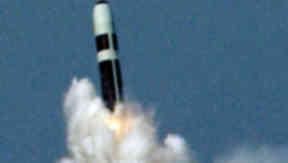 The party's Campaign for Nuclear Disarmament (CND) group held a seminar in Glasgow aimed at educating fellow Nationalists about the consequences of any policy shift for the Yes campaign in the referendum. Defence spokesman Angus Robertson MP has put the issue on the agenda of the SNP's annual conference with a motion supporting Nato membership. 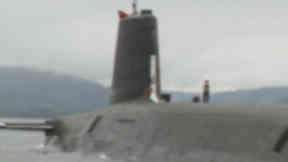 First Minister Alex Salmond has insisted the party remains committed to removing the Trident nuclear submarines from the Clyde, but campaigners say that remaining in Nato would compromise that objective. A number of groups within the SNP, including the party's youth wing, have pledged to oppose the motion at the autumn conference, while five MSPs took part in the CND seminar. Gareth Finn, SNP CND group convener, said about 65 people attended in total. "It was an impressive turnout with members coming from across the country rather than just from Glasgow," he said. "The aim was to educate the members of why SNP CND are opposed to changing current party policy. The next step is for members to go back to their SNP branches with that information and pass it around. "We want to expand the debate to a grassroots movement rather than just discussing it in the hierarchy of the party." "The main issue is that Nato is a nuclear alliance and it doesnt fit in with our vision for Scotland. We are a prosperous and outward looking country, I dont see why we need to be part of the alliance because I don`t see any threat to Scotland." A briefing paper circulated by the CND group this week said the about-turn on Nato membership could damage support for independence and make the SNP appear "cynical and lacking in moral courage". It said: "It alienates almost all active supporters of independence outside the SNP and will cause more conflict within the Yes campaign. It removes all differentiation between the SNP and the other parties. It does nothing to counter the media onslaught from those that oppose independence." A University of Strathclyde poll carried out in May found that 52% of SNP members surveyed want to remain in Nato. "Being able to determine your own defence and security policy is one of the most significant advantages of independence. We should make better decisions in Scotland and a conventional non-nuclear Scotland working fully with our neighbours is the best outcome."